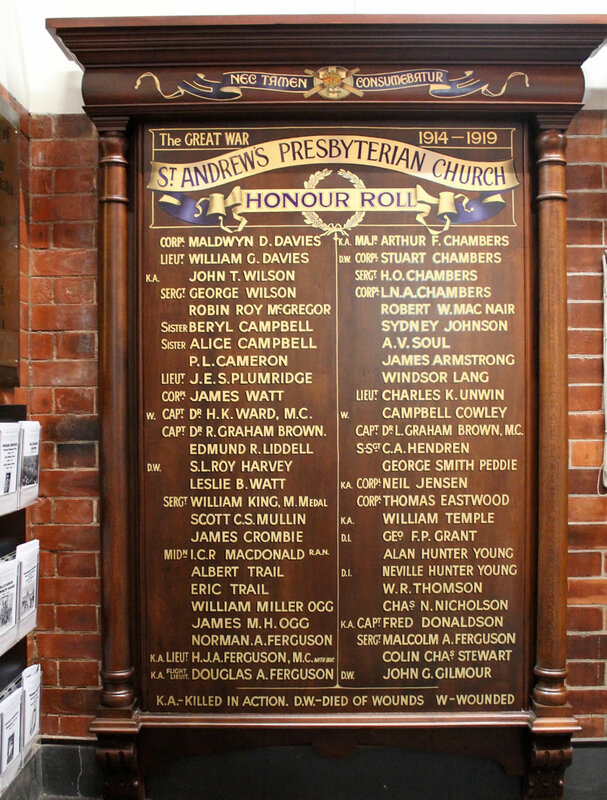 The honour board in the Merrington Anzac Memorial Peace Chapel bearing the name “A. V. Soul” was unveiled by Rev. Dr E. N. Merrington on Sunday 23 September 1917 while Valentine Soul was serving as a YMCA welfare officer amongst Australian soldiers camped at Salisbury Plain in England. An active Anglican layman, he had earned a good reputation for his work on behalf of the Young Men’s Christian Association while stationed in Brisbane for several months in 1915 and 1916. Valentine Soul was born in Dublin on 14 February 1877, the youngest child of George Simmonds Soul and Anne Bruce née Holt. After a short period in Dublin while Valentine Soul was still a boy, the Soul family of one daughter and five sons returned to London. Mr George Soul was a commercial clerk. In London, Valentine Soul gained business training with the firm of Tarn & Co, linen drapers, silk mercers, boys’ and ladies’ outfitters, boot makers and furniture manufacturers. It was said that at the age of 16, Valentine Soul was the youngest commercial traveller on the road in London. His first order was for 8,000 yards of embroidery, obtained within an hour of starting. Valentine Soul became a lay preacher and Sunday school teacher in London. At the age of 20 he started a boys’ institute and brigade in North London. His mother died at Islington in 1900. Mr A. V. Soul made business trips to Australia in 1904 and 1907. His cousin, Washington Soul of the well-known chemists of Sydney - Washington H. Soul and Company - had invited Valentine Soul to Australia, a land of opportunity. On the first occasion Valentine Soul travelled to Sydney via America and carried out his commercial activities while based in Pitt Street. He sailed from London again in 1907 on board the steam ship Orotava, arriving in Sydney on 14 June. His work involved sales and marketing. He was an enterprising and successful businessman, making clever use of advertising. In 1908 and 1909, Valentine Soul was honorary organising secretary of the Young People’s Scripture Union having been specially licensed to preach by Rev. Dr Saumarez Smith, then Anglican Archbishop of Sydney and Primate Archbishop. Based in Sydney, he travelled to towns and cities in Australia including Brisbane, Mittagong, Wollongong, Newcastle, Perth, Adelaide and Armidale, occupying pulpits in churches and cathedrals and addressing meetings and rallies in town halls. Mr Soul who was proud to represent a worldwide movement with a membership of some 700,000 readers was aiming to raise at least £1,000 so that a strong organisation might be formed in Australia. He gained the support and patronage of Lord and Lady Northcote1 who expressed a desire that the Scripture Union work may be efficiently carried on. Mr Soul spent the years 1910 – 1913 in Melbourne as a manufacturer’s agent in Flinders Lane while his private residence was in Morang Road in Hawthorn, later 161 Power Street in the same suburb. He became president of the Church Missionary Association’s Sowers’ Band. In his year of office he increased the funds considerably. He was also leader of a very successful young men’s Bible class in Hawthorn. Though twice offered ordination, he remained a layman, saying he was content to be “a helper of men”. Mr A. Valentine Soul visited his family in England early in 1915 staying with his father at Tufnell Park, London. Soon after returning to Melbourne on 28 March on board SS Morea, Mr Valentine Soul commenced work with the Young Men’s Christian Association (YMCA). A major reorganisation of the association resulted in the allocation of a vital role and responsibility in Brisbane to Mr Soul. It was wartime and the YMCA Hut in North Quay beside Victoria Bridge became a prominent and friendly meeting place for young men about to serve overseas in the Great War. Along with his many duties, Mr Valentine Soul regularly addressed the weekly meeting for men and senior boys in the front hall of the YMCA Building. In August 1916, a plan for Mr Valentine Soul to go to the Front as a YMCA welfare officer became known. Farewell functions were organised. Lady Rutledge received a number of friends in the front hall of the YMCA Building which was decorated for the occasion. A musical program was presented. Reference was made to the splendid work done by the YMCA among the troops everywhere. Canon Garland was present, also the assistant minister of Saint Andrew’s Presbyterian Church, Rev. J. Robb and the principals of the Methodist and Congregational Theological Colleges. Dr and Mrs Hamlyn-Harris held a second reception which was attended by many of Valentine Soul’s friends. Mr Soul had spent much time and effort appealing for funds and gifts for soldiers. Before he left, he visited The Southport School and took the opportunity of personally thanking donors there for the piano they had kindly donated for the troopship and the carrier for conveying it free of cost to the station. Many parcels were received by Mr Soul for the comfort of the soldiers on the troopship. A.A.V. Soul spent the next 18 months on YMCA work on Salisbury Plain in Southern England. During his brief return to Brisbane afterwards he gave talks on his experiences, even resuming his popular talks in the front hall of the YMCA Building. Very soon however he proceeded to Colombo, Ceylon (now Sri Lanka) to be YMCA army secretary there for a further two years. In 1920 when he reached Brisbane again he was titled Captain Soul and described as a man brimming over with enthusiasm for the great organisation he represented. Reports of Captain Soul’s indefatigable labours in Sri Lanka were becoming well known in Brisbane. It was announced in August 1920 that an appeal was being made by the Young Men’s Christian Association for £100,000 with which to erect a new building in Melbourne to serve as the headquarters for Australia. Valentine Soul moved to Melbourne to take a major part in that appeal. He did so most capably because of his long and wide experience in many spheres around the world. Alexander Arthur Valentine Soul lived in Melbourne for the rest of his life. It is not known why Alexander became his first name. According to Irish records, he was named and baptised Arthur Valentine Soul. He lived for many years in Grey Street, West St Kilda and later settled at Hampton. He was interested in freemasonry, a member of Clarke Lodge, Ancient Free and Accepted Masons of Victoria, and a member of the Baden Powell Lodge. In Victoria he was a leading member of the Big Brother movement, Commissioner (Social Justice Department), Boy Scouts Association, vice-president of the Royal Victorian Liedertafel (male choir). He was vice-president of the Melbourne City Mission, senior church warden at Holy Trinity Church of England at Hampton, and as a lay preacher for that church travelled extensively throughout the state. Valentine Soul died in 1950. His funeral service on 1 November in Holy Trinity Church of England, Hampton was conducted by Bishop Baker and his body was cremated at Springvale Crematorium. 1. Sir Henry Stafford Northcote was Governor-General of Australia between 1904 and 1908. • Hart, J.H., Souvenir of Y.M.C.A. City Hut, North Quay, Brisbane, 192-?